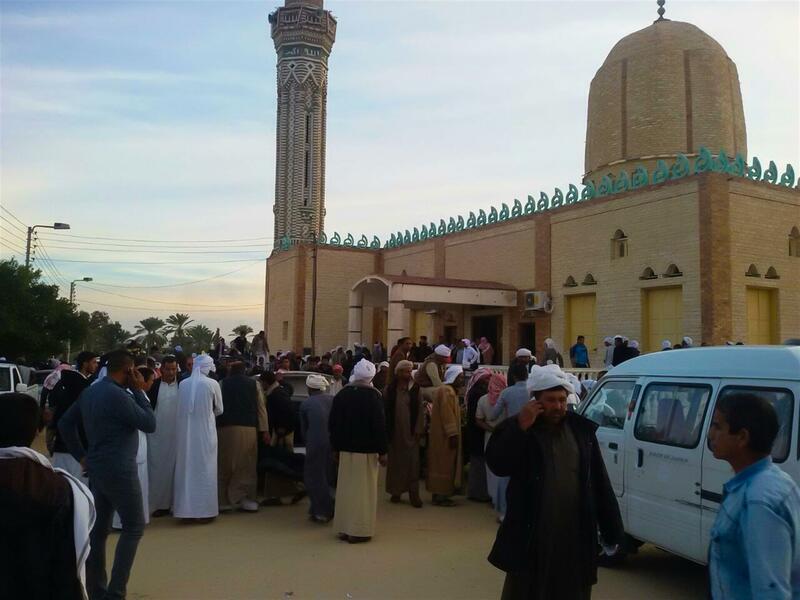 Cairo, Nov 26: The death toll in a terrorist attack on a mosque on Friday in Egypt's North Sinai has risen to 305 killed, including 27 children, and 128 others were wounded, state news agency MENA reported on Saturday. "The attackers of the mosque were carrying the Islamic State flag," MENA quoted the statement of the country's general prosecutor as saying. Long queues of the victims' relatives were laid on the ground, some covered with blankets, outside the Suez Canal Hospital in Ismailia. "My 23-years old nephew, Amir, who was working as a nurse has passed away in the attack," said Samy Mohammed, who came from Delta Menoufia province to get the license of burying Amir said. The father of Amir, Magdy, a 45 year-old teacher has also wounded in the attack by three bullets, two in his leg and one in his right arm, Mohammed told Xinhua. "I couldn't get the body of Amir and he was buried in collective graves with the others," he said while weeping. But Mohammed was waiting to ensure the status of the father who underwent some surgeries. The father, Magdy said the terrorists for the first time attacked mosque because they failed to cause rift between the Copt and Muslims and also found difficulties in targeting more security men. President Abdel Fattah al-Sisi instructed the Armed Forces to set up a memorial for the victims who lost their lives in al Rawda mosque terrorist attack, official sources told MENA on Saturday. Some of the worshippers were Sufis, members of Islam's mystical movement, whom groups such as the IS consider as "infidels." Local militant group Ansar Bayt al-Maqdis, once allied to al-Qaeda, split from it and declared allegiance to the IS in 2014. Sufis have been a target of Ansar Bayt al-Maqdis who burnt one of their shrines in 2013. Also the IS affiliate in Sinai has beheaded a 98-year-old man who was considered as the Sufist's spiritual leader in North Sina in November 2016. No group has declared responsibility for the al Rawda attack yet. North Sinai province, a mostly desert area bordering Israel and the Palestinian Gaza Strip, has been experiencing waves of anti-security attacks that killed hundreds of police and army men since the army-led ouster of Islamist president Mohamed Morsi in 2013 in response to mass protests against his rule. Now they started to target the Muslim worshipers at mosque for the first time, which is an unprecedented development in terrorist tactics in the country, according to security experts. The law enforcement forces continued their operations to hunt down elements involved in the brutal terrorist attack that targeted worshipers, the Armed Forces said in a Saturday statement. Egyptian president Abdel Fattah al-Sisi vowed on Friday a "fierce action" against attackers. Egypt's military said they had carried out airstrikes and raids overnight against militants held responsible for the killings, the bloodiest attack in Egypt's modern history. The Interior Ministry declared a state of high alert nationwide.